Austrian actor; born June 7, 1840, at Vienna; son of Adolf Herzfeld. He received his education at the gymnasium of his native town, and entered a wholesale business house there as an apprentice. 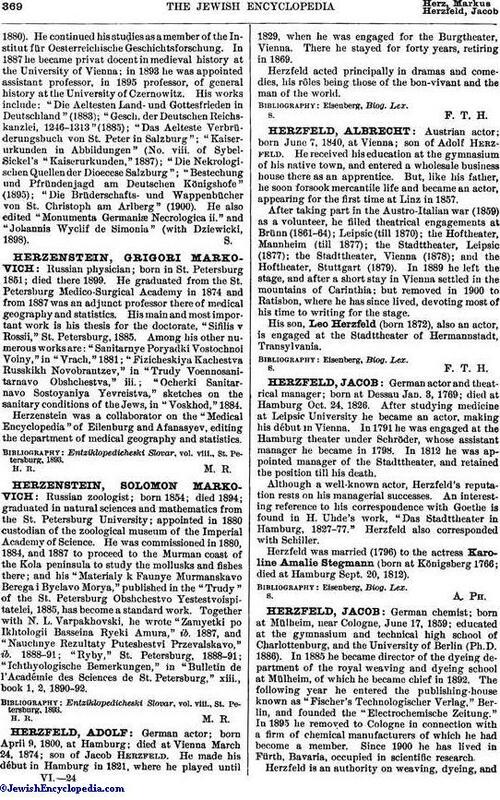 But, like his father, he soon forsook mercantile life and became an actor, appearing for the first time at Linz in 1857. After taking part in the Austro-Italian war (1859) as a volunteer, he filled theatrical engagements at Brünn (1861-64); Leipsic (till 1870); the Hoftheater, Mannheim (till 1877); the Stadttheater, Leipsic (1877); the Stadttheater, Vienna (1878); and the Hoftheater, Stuttgart (1879). In 1889 he left the stage, and after a short stay in Vienna settled in the mountains of Carinthia; but removed in 1900 to Ratisbon, where he has since lived, devoting most of his time to writing for the stage. His son, Leo Herzfeld (born 1872), also an actor, is engaged at the Stadttheater of Hermannstadt, Transylvania.